The business of business isn’t just about creating profits for shareholders — it’s also about improving the state of the world and driving stakeholder value. The declaration above comes from Marc Benioff, Chairman and CEO of Salesforce, writing in a recent article in The Huffington Post (source). And as Steve Denning notes, a commentator who has been writing about this theme for a long while now, while the concept of stakeholder value remains the conventional wisdom throughout much of big business, “What’s different now is that a consensus is forming around a better idea” (source). How do we define “long term” and “value creation”? How can we describe the real world complexity of business while capturing our aspirations for corporations? When it comes to purpose, does one size fit all? If not, how do we define the roles and responsibilities of business leaders? How and what do we teach business students? How do we achieve accountability? These are excellent questions, and a real indication that we are moving from a primarily financial and shareholder-focused view of business to a values-based business. However, this shift is by no means simple for people make, since it requires an entirely new mindset, a shift from economics to holonomics – where people and planet matter. This shift is central to our book Holonomics, in which we introduce the Holonomics platform. In executing any profound transformational strategies or implementing change programmes, before we can introduce new business models we require a systems view of the organisation. However, this systems view can not be mechanistic or Cartesian, since any attempt to introduce the new business model (and value proposition) will still be articulated and understood using the old logic, and therefore are likely to fail. Systemic – Understanding the organisation as an organic and dynamic system of interrelated organs. Experiential – Understanding the lived experience of each person – employees, management, leadership, stakeholders and the community. Meaning – Understanding how shared meaning emerges in the organisation over time, allowing the organisation to be able to become agile, efficient and transparent – an authentic whole. 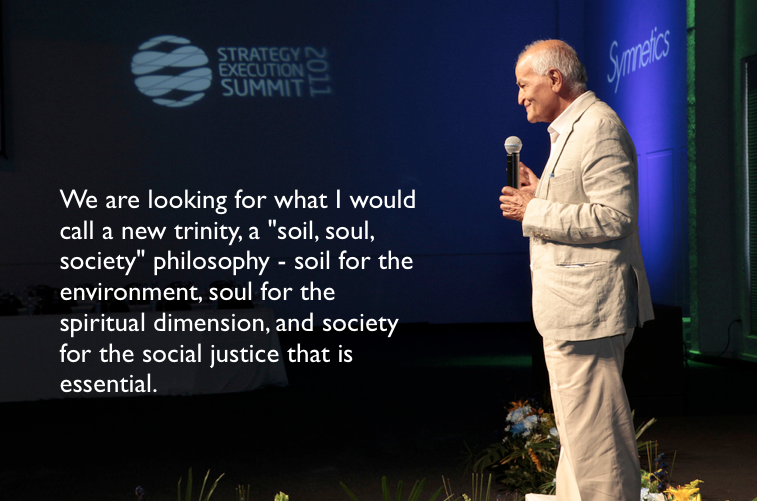 These three components – systemic, experiential and meaning – are exactly what is required to develop future sustainable business propositions. So now having made this central point that future value will only be authentically developed in organisations who are able to both transform and develop a higher level of consciousness, I thought I would take a look at two books which focus on Value Propositions, what they are and how they are created; the recently published Value Proposition Design: How to Create Products and Services Customers Want by Alexander Osterwalder, Yves Pigneur, Gregory Bernarda, Alan Smith and Trish Papadakos, and Creating and Delivering Your Value Proposition: Managing Customer Experience for Profit by Cindy Barnes, Helen Blake and David Pinder. In order to understand the strengths of these two books, I thought I would start with a brief history lesson, in order to take a look at the manner in which organisations described their value propositions prior to the development of a more visual approach and the utilisation of business canvasses. 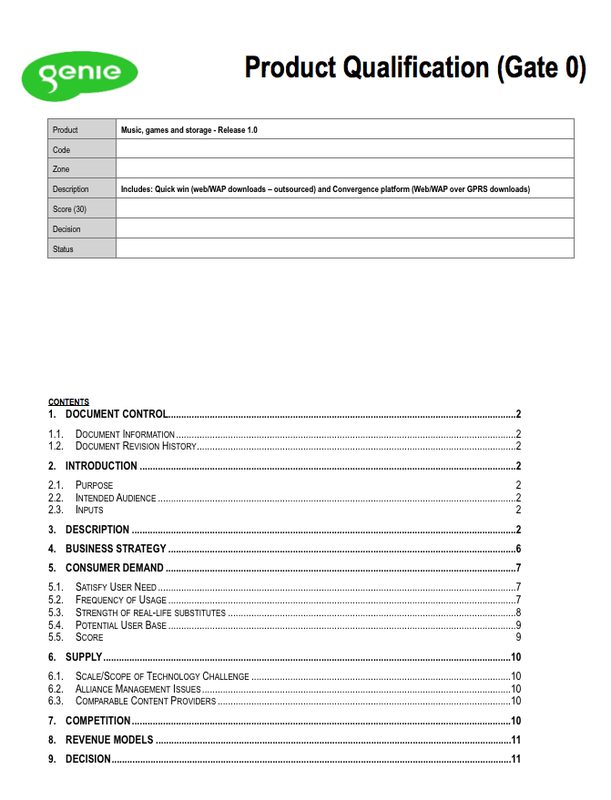 The picture above shows the front page for the Gate 0 template used at Genie and BT Cellnet (I will assume that readers are familiar with phase – gate innovation processes). The document was written as part of the larger project to develop Genie into a global entertainment portal. I thought it had historical interest due to showing how mobile networks and portals were developing their music propositions prior to the watershed moment when Apple entered the fray. 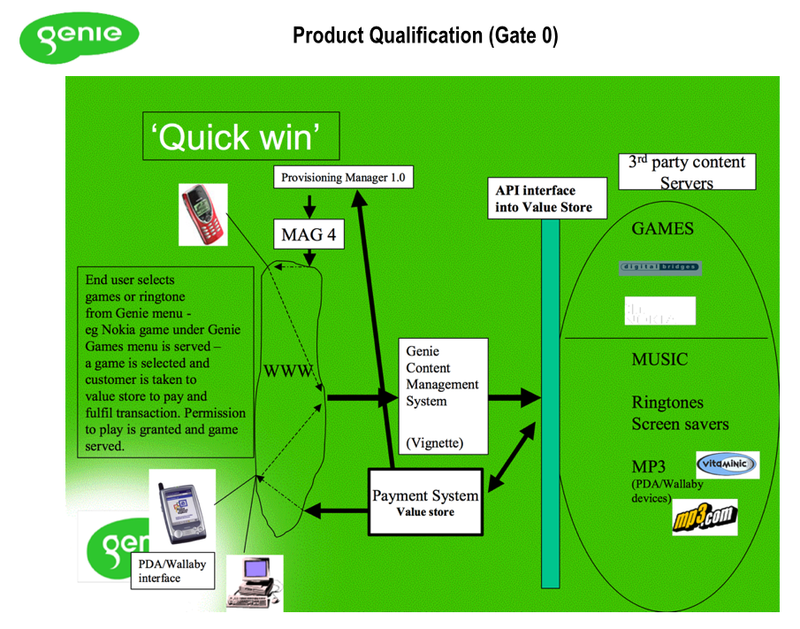 As you can see from the template, all the major elements of the value proposition, the customer experience and the nascent business case financials have to be in place, even at Gate 0. In 2004 Alex Osterwalder, in his thesis The Business Model Ontology: A Proposition in a Design Science Approach proposed that a business model consisted of nine key pillars. Following this work, in 2008 Osterwalder proposed a business model canvas (source), which is a visual chart for describing a business model. There can be no doubting the incredible impact that the concept of the visual business model canvas had across the world, introducing in one simple chart a visualisation of a proposition which could facilitate more holistic understanding across organisational bunkers. However, some time ago I did offer a critique of the business model canvas, in that although of course it does feature the concept of value proposition, if an organisational or group-wide mental model is one focused on stakeholder value, no matter what the tool, the thinking will be focused on this and not customer value generation. It has therefore been excellent to see the launch of Osterwalder and gang’s new book Value Proposition Design, in which the Value Proposition Canvas is introduced. 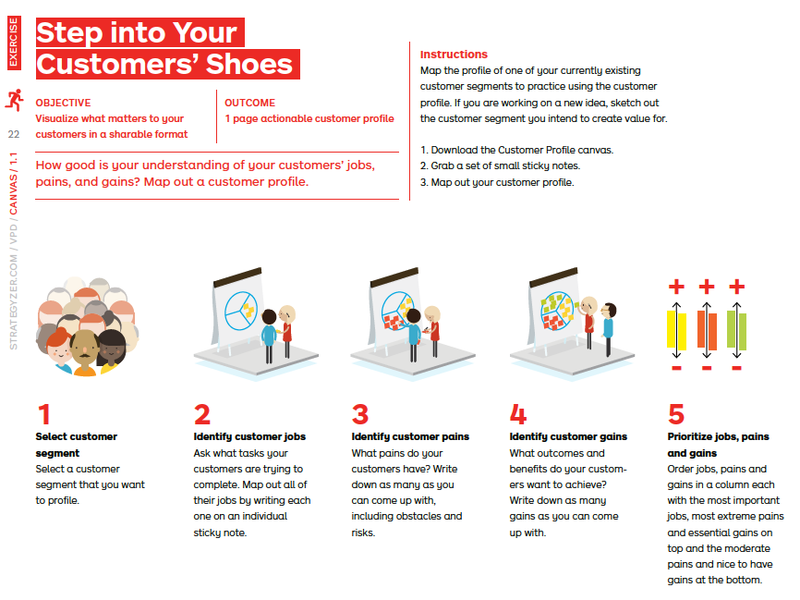 The Value Proposition Canvas has two sides; the Customer Profile which articulates the manner in which the customer is understood and the Value Map which describes value is created for that customer. 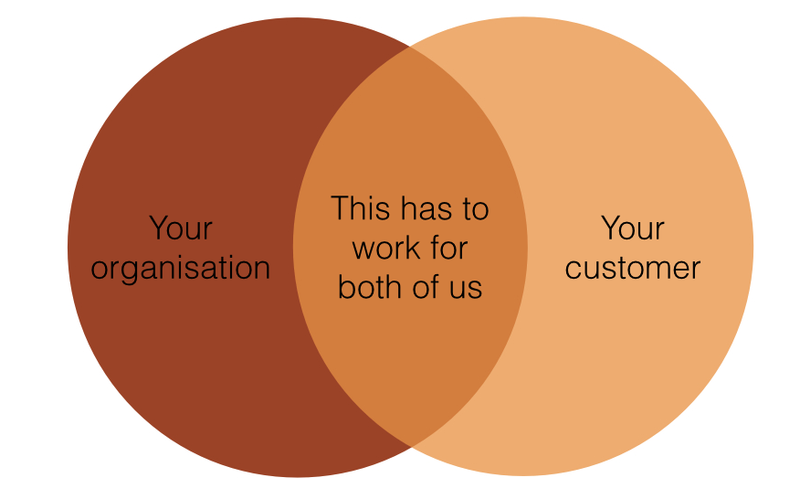 The idea is that the organisation achieves a fit between the two. Many criticisms of the work of Osterwalder and the team behind this work is that it is obvious, and only really suited to people who have not worked in the area of business model development of value proposition development. I am slightly schizophrenic in that while I do have one foot in this camp, it is quite obvious from the success of the many thousands of workshops and lectures given by Osterwalder himself to senior executives that despite reaching their positions in their businesses they have clearly benefited from this as a tool. Despite being the very people who should live and breath customer value, their elevated positions have taken them far from their customers and the daily lived experience of their customers, meaning they have lost sight of what makes a company great. What Value Proposition Design has done is to provide a new level of granularity, allowing people to now zoom in and out of their conceptualisations of value, in a way in which is now truly powerful and beneficial. Credit: Alexander Osterwalder et al. 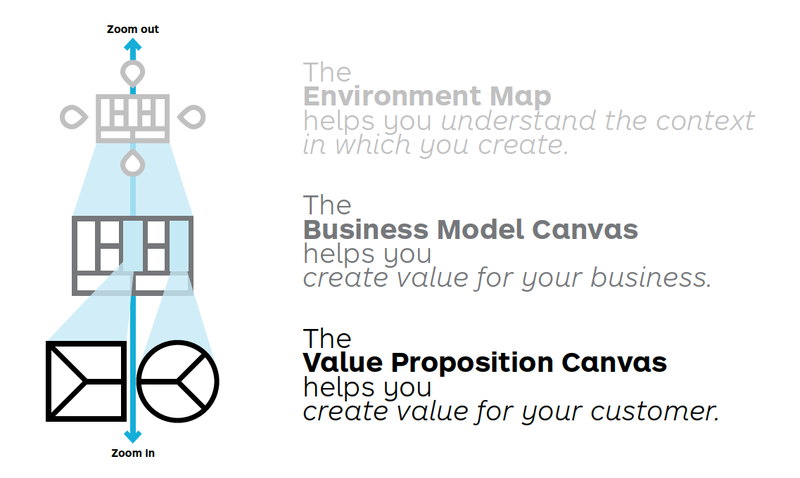 If I was introducing students to the concept of business models and value propositions for the very first time, there is no question that the best place to start than Business Model Design and Value Proposition Design. However, one quite major element still missing, and this is an element I think they should address in future work, is the creation of the business case. Business cases are technical, hard, they require the participation of the organisation’s management accountants, and in an uncertain world, have to provide revenue, costing, and return on investment predictions across time scales which are measured in years and not months. I have seen people create business models with no business case, and this is where the rubber hits the road so to speak, and separates well-conceived and fully comprehensive models from the incomplete. In this simple diagram the authors capture the essence of a sustainable business model. The proposition has to work both in terms of customer needs, and the financial needs of the business. From a holonomic perspective, and the perspective of social or conscious business models, when the definition of us expands beyond shareholders to stakeholders, both people and planet, then we have an authentic value proposition that has an authentic level of value, including what I have previously termed holonomic brand value. 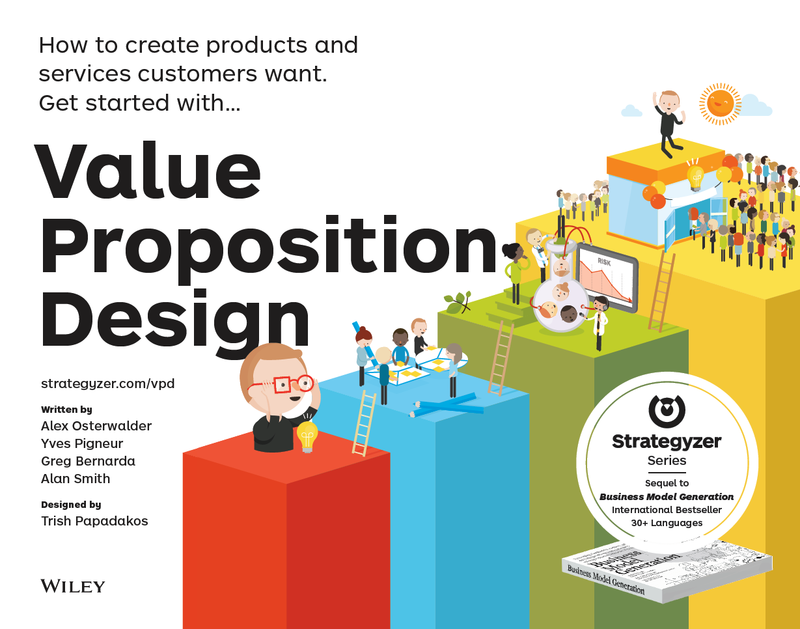 There are two excellent elements to Creating and Delivering Your Value Proposition that make it both stand out from books on a similar theme, and which also allow it to complement and dovetail nicely with Value Proposition Design. The first is that not only does it explore in detail what a value proposition is, what is expertly provides in detail is the Value Proposition Builder™, a step-by-step process required to develop and implement a value proposition in practice. The second aspect of Creating and Delivering Your Value Proposition which is somewhat more subtle, but extremely powerful, is the insight that “a value proposition is not what you do. It is the value experience you deliver”. As the author’s point out, before you can step into another’s shoes, you have to take off your own. 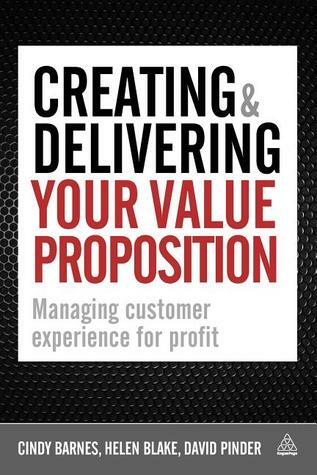 Therefore we end up with the conclusion that “the real power of value proposition thinking is in the process”. I absolutely agree with Barnes, Blake and Pinder in their highlighting of the idea that customer experience will be the next competitive battleground. It is here where our own book Holonomics I feel provides a radical new way to develop value propositions by helping designers go upstream into the act of seeing itself, where you enter into the lived experience of others, and discover the wholeness within this lived experience. What this means is that while many talk of business ecosystems, thus breaking out of the straitjacket of shareholder value, these new concepts are often discussed in a Cartesian manner, meaning that both the customer experience itself, as well as these processes of developing customer value, become codified. But when you go into the act of seeing itself, you develop a sensitivity to the lived experience of others, you discover how your own way of conceiving what to you may be quite obvious and solid and shared experiences, are anything but. And on the other hand, you discover that when you explore the lived experience of others, you not only differentiate other’s experiences to your own, you also at one and the same time, relate. Our business models become holonomic when we discover their intrinsic wholeness. The customer experience is no longer merely quantified using traditional measures, but also quantified, as each and every person in an ecosystem comes to develop a shared understanding and meaning. Now that Holonomics has been available for a few months, it has been brilliant for Maria and I to hear from many different readers with many different backgrounds, including people from the areas of sustainability, social enterprises, consultancy, innovation, banking and many more. We have heard how Holonomics has inspired people to develop their own new and exciting business models, to help develop unify organisations while not losing diversity, and to help implement new strategic plans and transformational change management programmes. What Holonomics is doing is fermenting within people a new dynamic way of understanding experience, and when this new understanding is then combined with the excellent tools and processes within Value Proposition Design and Creating and Delivering Your Value Proposition, the outcome is a new conception of future value generation, where people and planet matter. These are exciting times for those developing more conscious business models for a new consciousness which as we speak is being born amid so much confusion, corruption and competition born of ego. I can strongly recommend both books, as they will help those of you with wonderful ideas progress to the point where you prototype, test and then really grounding them in a manner which has lasting and effective impact. I wish you all the very best of luck in your ventures developing sustainable future value for our future generations. Hi Simon, This is one of the most thoughtful reviews and analysis of what’s happening in the world of value proposition design that I’ve seen. Thank you for including our book. Entering into the customer’s lived experience is no trivial matter, as I know you know well Simon, and yet is essential. I’m passionate about how the customer experiences value and how their lived experience needs to be brought directly into value proposition design at the strategy level, at the product/service level and every level in between. Organisations of all shapes and sizes can benefit from this experience-led, customer-centric value proposition approach and clearly this dovetails very neatly with your excellent Holonomics approach making the prospect of long-term, co-created value realisable.